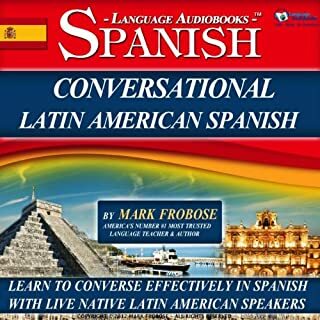 What did you love best about Conversational Latin American Spanish - 8 One Hour Audio Lessons (English and Spanish Edition)? Easy to follow along. Not too fast. Not too slow. I recently received this program from audible and have spent about six hours listening to it over the past couple of days. And I DO know why I am giving it 5 stars. I disagree with the reviewer who said that the narrator’s voice was ‘condescending.’ The narrator is not a professional orator or broadcaster. He is a language teacher and I think the narrator’s tone is simply his attempt to just try to be considerate of the learner and to make the program pleasurable to listen to. This program has great Latin Americans native Spanish speakers, and is easy to understand and repeat after. It’s a very back and forth approach to conversation, back and forth between you and the teachers. No guessing about meanings. You are always reminded of what the Spanish words and phrases mean in English. You can focus on the new Spanish word without distracting yourself trying to remember what the English translation is. Lots of vocabulary that is good for shopping, eating, and just getting around in a Spanish speaking country. It mixes stuff you already learned with new stuff so that you are reviewing previous things at the same time that you are moving on to something new. I’m very happy with this audio program and I still have a couple more hours to go. If you could sum up Power Spanish 2 Accelerated in three words, what would they be? 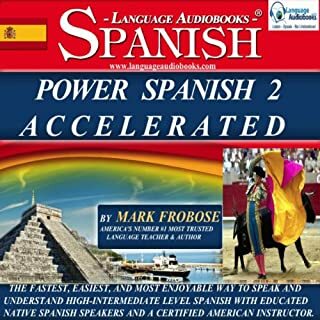 What other book might you compare Power Spanish 2 Accelerated to and why? A good sequel to Power Spanish 1 Accelerated. You can use these audio lessons in any increments you like, whatever is convenient for you. Power Spanish 2 Accelerated – Really Helps You Become Fluent in Spanish. Power Spanish 2 packs a LOT of material into its eight hours of lessons. If you have a basic knowledge of the Spanish language then Power Spanish 2 Accelerated will power your Spanish to a higher level. This program is not for the fluent in Spanish. The whole reason for the program is to help you to BECOME fluent in the Spanish language. I really think I got more than my money’s worth. Power Spanish 2 Accelerated is not just a re-hash of Power Spanish 1 Accelerated with a few new words and phrased thrown in. There is all kinds of vocabulary words covering all kinds of topics, like eating and drinking and having parties, and buying tickets to go to places and finding your way around places. I really learned with the variety of instruction. Sometimes you remember and recall, then you directly participate with native Spanish speakers. Often you listen and repeat and at other times you just listen. You get some simple grammar instructions in some of the sections of the program. They are very short and deal with the lesson being given at that moment. The lessons are somewhat structured but still spontaneous and the overall presentation is relaxed and informal. The narration has a very personal feel to it. It is not like some language learning recordings where the narration is done by deep-voiced, monotone, stiff and formal radio type of narrators. Mark Frobose, the developer of the program, serves as the narrator/teacher throughout all of it with different educated Spanish speakers. Like I said, it has a very personal feel to it. Mark and the speaker even laugh occasionally as they are explaining funny things. It really does sound like it is a private lesson between you and the native speakers and the narrator. But it does move pretty quick. This program is excellent for someone who really wants to learn to speak Spanish fast.